Lame Duck Books, a mainstay of Cambridge, Massachusetts' Harvard Square, will close its doors on September 25, 2010. John W. Wronoski, who opened Lame Duck originally in Philadelphia in 1984, told the Harvard Crimson that the business was "hemorrhaging" money, "destroyed" by online competition. “Nowadays people like myself who’ve devoted...50 years to this world have no means of competing again,” he said. 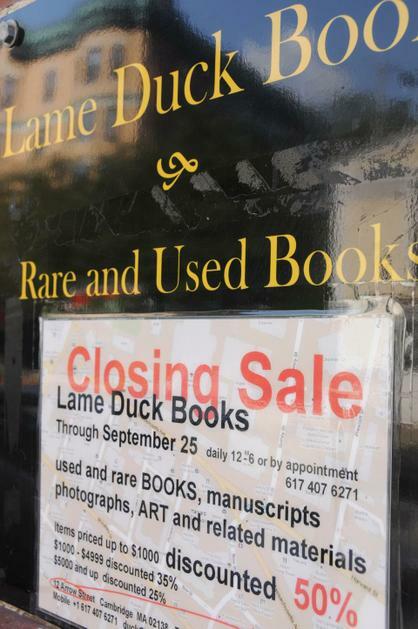 Lame Duck Books will be missed. Full story at Harvard Crimson. Indeed. And John's brother James Wronoski's novel, Knaves in Boyland (Merwood Books, 1997), is worth checking out -- a true small-press gem from the days before POD turned everyone with a word-processor into an "author." Literary Action Figures to the Rescue! Man Born With Dog's Head! The Bars of Paris, A Bar-Room in the U.S.